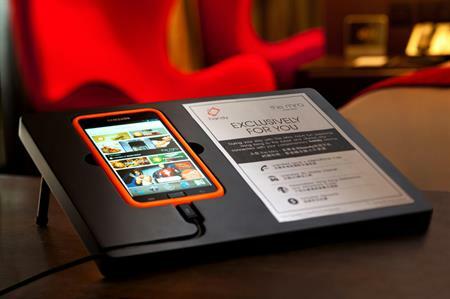 The Mira Hong Kong hotel is to integrate smartphones into all 492 of its rooms by next month. The technology will give guests instant access to free unlimited local and international phone calls and 3G connectivity will enable wi-fi access for other mobile devices such as laptops and tablets. The service, dubbed 'handy', will also include simple room-to-room dialling alongside access to a personalised 'My MIra' concierge service. The device also equips guests with a digital city guide to better explore the city. The hotel overlooks Kowloon Park and is located in the Tsimshatsui district.